Is your new years resolution to take a few strokes off your golf game? 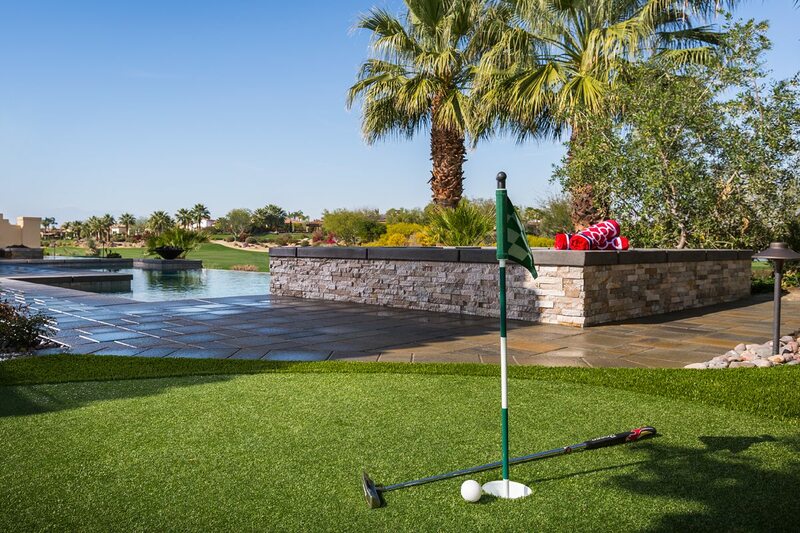 As the legendary Arnold Palmer once said, “It’s a funny thing… the more I practice, the luckier I get.” Get “luckier” by installing an artificial putting green in your backyard, which makes it easier for you to practice any time that suits you. Discover the advantages of artificial backyard putting greens. Convenience- No more waiting in line to tee off or wondering if the golf course will be crowded when you get there. Grab a cold one from your fridge and step outside to practice your skills for as long as you want, anytime you want. Not to mention saving you the hassle of traffic, why waste time sitting in traffic when you can spend that extra time building your golf game? Cost Effective- It might seem like a big step financially at first but in the long run the money that is saved by installing artificial putting greens or an entire back yard will save you enough money to pay for itself several times over. You’ll no longer have to pay expensive green fees or waste gas driving to and from the course! Low maintenance- A backyard putting green will fit into your busy lifestyle giving you more time to do what you love… GOLF! Not to mention no more watering, weeding or trimming saving you time and money! Quality- We use the best artificial turf in the industry, Celebrity Greens has been trusted by CBS golf analyst Peter Kostis, legendary Nascar driver Rusty Wallace, and PGA tour player Paul Casey. You’ll get the best quality turf installed by the most capable team of designers and installers. We work with homeowners to choose a design that encourages improvement in their golf game or to help them maintain their current level ability. We can use the natural contours of the lawn itself as a way of adding new challenges. Want to add sand pits or ponds to increase the level of difficulty we got you covered! Make this New Year your best golf year yet! We at Teserra would like to help your dreams of creating the perfect outdoor space and perfect golf game a reality!